This is a creative stationery branding mockup scene creator you can use to make your own unique mockup scenes to showcase your designs. It comes with 62 different stationery items you can rearrange and customize to make creative mockup scenes. It also includes 6 pre-made scenes as well. This elegant and beautiful isometric mockup bundle comes with 4 unique mockup scenes for showcasing your professional stationery designs. The templates include 21 high-quality moveable items you can use to customize the design to your preference. A bundle of website mockup templates featuring 20 different isometric website mockup designs. The templates let you showcase your designs in various angles and views. You can customize the templates using Photoshop CS1 and higher. This creative and elegant post mockup features a stylish isometric layout. You can easily edit the template to paste your own mockup designs using smart objects. It also includes 4 different effects. Showcase your app screens, website designs, and social media designs using this iPhone XS isometric mockup template. This template comes in 3 different views. You can edit them using either Photoshop or Illustrator as well. This bundle of isometric envelope mockup templates will come in handy when you’re working on stationery branding designs. It includes 4 different premade mockup scenes with smart objects for easily placing your designs on the mockups. A collection of modern mockup scenes featuring isometric angles. The bundle includes 5 different mockup templates you can use to showcase your stationery branding designs. If you’re working on a business card design, use this isometric mockup template to present your designs to your client. It comes with 3 different isometric mockups with backgrounds and smart objects. A realistic iPhone XR mockup template featuring an isometric design. This template comes with a changeable background and smart objects for easily editing the template with just a single click. This modern and minimal isometric mockup template allows you to showcase restaurant menu designs in a professional way. The template features backgrounds and smart objects. This is a massive bundle of elements that are all available in isometric design view. The pack includes over 100 high-resolution elements such as stationary mockups, iPhone mockups, laptop mockups, bag and packaging mockups, and much more you can use to create your own beautiful mockup scenes for your website headers, social media, presentations, and more. If you’re looking for a mockup to showcase your website designs, this perspective isometric mockup template will come in handy. This is a bundle of mockups that features mockups in 11 different perspective views. All of which are available in easily editable high-resolution PSD files. 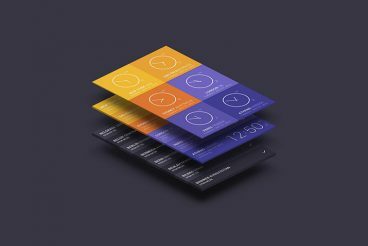 Inspired by flat design, this isometric mobile screen mockup allows you to showcase your website and app screens in a modern and an elegant way. You can download and use this template free of charge. Another pack of isometric website mockups for showcasing your website and web apps. It includes 6 mockups with different views. The mockups are available in 3920 x 2600 resolution and in smart layered PSD files. You can easily edit them to place your designs in the mockups. This mockup template is for graphic designers who work with business cards. This is a two-in-one template that includes business card mockups for both dark and light themed designs. The PSD files are also fully customizable. You can choose between an aligned or misaligned stack of cards, remove shadows, change backgrounds, and more. A free website mockup template featuring an isometric view. It’s ideal for giving your designs a stylish 3D view. This template is best for presenting a website design or using it to design a website header image as well. Here’s a rare mockup of a MacBook Pro in isometric view. There aren’t many MacBook mockups available in this type of perspective view. You can use this mockup to craft a unique website header or add more style to your design presentations. Couple that MacBook Pro mockup with these iPhone 7 mockups. This is a bundle of 72 iPhone 7 mockups that feature the device in multiple isometric perspectives. You’ll have plenty of choices for finding a great iPhone mockup with this pack. Another free and high-quality mockup for showcasing your apps and websites on a mobile screen mockup. These isometric mockups feature a gorgeous flat design style that will definitely add more value to your work. If you’re working on a stationary related design, use this mockup generator to create your own mockup scenes for your presentations. This pack comes with lots of separated elements in isometric view for creating different types of mockups for showcasing stationary designs. Showcase your business card designs with this professionally crafted business card mockup template. It allows you to showcase both front and back of your designs. The mockup is free to download. This A4 sized mockup is simply perfect for showcasing your flyer and brochure designs. The template is available as a PSD file with customizable stack colors, shadows, and backgrounds. An isometric mockup template designed specifically for presenting your brochure designs. The template is available in US letter size and in 3000 x 2000 resolution. The PSD is fully editable as it comes with smart layers and customizable shadow and shading effects. Another mobile app screen mockup featuring isometric view. This template is also free to download and use with your projects. It’s perfect for showcasing your app features on a landing page or a social media post. iPhone 6 is a bit old now, but this isometric mockup can still help you showcase your app features and designs in a whole new way. Besides, you can’t really tell the difference between this iPhone 6s and the new iPhone 8. The pack includes 8 mockup files with 2 perspective views. This bundle of isometric mockups gives you more than enough mockup templates for showcasing your different types of business card designs. It comes with 10 different mockup templates with different views. The stack colors and the backgrounds of these mockups are also easily customizable. This is a multipurpose mockup that you can use to showcase many different types of designs, including apps, websites, brochures, flyers, and more. The mockup is features 3 different depth sizes for achieving the perfect 3D like view. If you’re working on a book cover design, here’s a cool isometric mockup you can use to easily edit and showcase your design. This mockup is ideal for presenting hardcover book cover designs. The pack comes with 6 mockup templates with different perspectives. Make your flyer designs look more attractive with the help of this isometric mockup template. This template comes with 12 different mockups with multiple perspective views for showcasing your flyer designs any way you want. Another high-quality and free isometric perspective mockup for showcasing your designs on an iPad Air 2. This mockup comes with all 3 different color models of the iPad Air 2 as well. This bundle of isometric mockup templates features 8 smart layered PSD mockups for presenting business card designs. These mockups are designed specifically for showcasing UK size (85x55mm) business cards. The mockups also feature automatically changeable reflections and sides appearance. If you’re looking for a mockup to promote a Kindle book, an Amazon product, app, or a website, this is the mockup you need for that job. This Kindle Fire HD mockup can be used to promote many types of designs and projects. It’s also free to download and use. Check out our food and drink mockups and website perspective mockups collections for more cool mockup templates.